You have a philosophy of “self” whether you know it or not. That philosophy or “stance” influences many of your other views of reality and thus your ways of interacting with others and treating yourself. 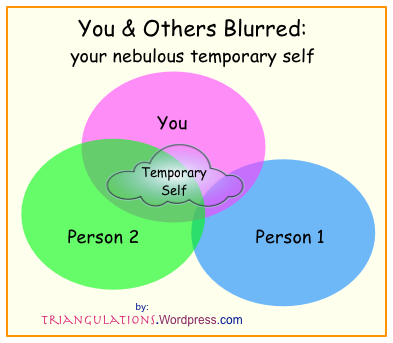 Many of my Triangulation posts are only understandable if you understand my view of self which I have called “No-Self, Many Selves“. In my view, any “self” we have at any certain time is merely a constellation of traits and relationships from amidst the many traits within us (see here). But another aspect of my view, as can be seen in my diagram above, is that others influence us in such a way that the notion of a self-contained self is silly: we are partially others. Our selves blur over the others we interact with — we blur in complex ways. Others not only trigger possibly latent traits or bring new linkages between our traits, they may act as models to mimic (new traits) or emotions to weigh quiet traits more heavily. Abstract enough? Point is, others can make us into different people while we are with them and even influence us in lasting ways. Are selves are not stable, but they certainly do exist. But if we feel they are self-contained, stable or consistent, we may find ourselves often surprised or inflexible. David Chapman’s stance on this issue seems very similar to mine (albeit much better developed), and I constantly learn from his writings. If you have time, read his recent post on “Selfness” for a flavor of his fascinating stance on reality. …questions of self are inseparable from questions of meaning: purpose, ethics, authority, and personal value. I totally agree with David’s point and it is why my blog here is peppered with posts on our “Many Selves”. My model is overly simple, but it is useful for me. I wonder where David feels it differs from his view. Tell us your view too. It may be hard to recognize this in oneself, but good literature may bring up it nicely. I have been lately re-reading The Dark Angel by Mika Waltari, in wich there are several such discussions described, in wich the different participants temporarily share a common ground from their respective views and sort of form a temporary self to understand what the other party is saying, while still retaining their own view and identity… As I can relate to those characters, I can also relate to what I think you mean by this post and recognize it from my own experience. I like your “blurring” metaphor a lot! I’m not sure whether or not there is any difference in our understandings here. It’s hard to tell partly because the subject matter is inherently blurry! So accounts of it are also bound to be blurry. My intention is not to explain blurry/many self for its own sake, but as background to “what are some good ways to live if we assume that’s the only sort of self we can have?”. Yeah, literature is a fantastic place for this principle to be made more clear. Agree. I keep looking forward to your future postings. To be more accurate, it’s one-fifth of online novel! I really really hope to finish turning the draft into publishable chapters Someday. Some people have enjoyed the fifth that is there, however! Whoa. I’m losing my “self” in your posts. I’ve bookmarked your index of posts so I can lose my “self” in them further.